...I get 5 empty records without values in returned List (screenshot is below). I'm doing something wrong or is there a bug? Can not be a problem with custom SqliteDialect.Provider.NamingStrategy? 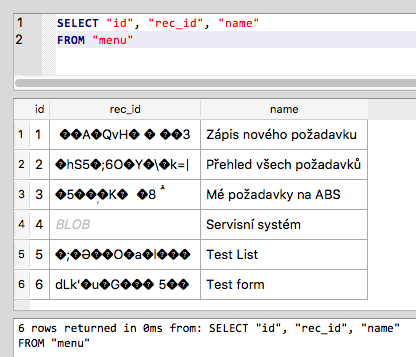 Mapping "Id" to "id" and "RecId" to "rec_id" .... "underscore separeted"
What does the results look like when you query the generated SQL? Also please provide the class definition for Entities.Menu and what RDBMS are you using? Looks like it may be PostgreSQL. And are you using any custom OrmLiteConfig or naming strategy? Yes the custom naming strategy is likely the issue. What naming strategy are you using? Can you provide the class definition of Entities.Menu and a screenshot of running the query in a GUI (generated in the debug log) so it shows the returned resultset. Can you provide a view of the resultset returned when running the query, i.e. so we can see what data is meant to be populated. 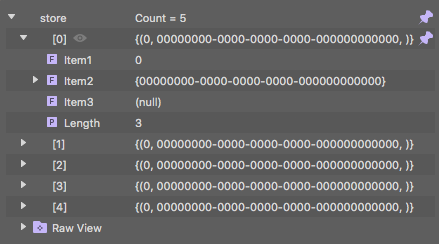 Maybe I also have the question why is GUID stored in char (36) as "binary"? I'm unable to repro this issue with the code provided in this commit, which passes in both .NET Framework and .NET Core. SQL: SELECT "id", "rec_id", "name"
The one change that was needed for OrmLite was making UserId public and removing the ForeignKey reference since no User class was provided but as it's not apart of the query it wont have any effect on the test. If you haven't already please upgrade to the latest version of OrmLite, if it's still an issue please upload a stand-alone repro on GitHub I can run locally to repro the issue. It looks good and the code seems to be equally. In my project the problem still exists. Look at this bellow - two same identical entities (Menu), first Select whole entities, second only some columns. I'm assuming OrmLite was used to create the tables right? If so, I'd need a small stand-alone repro in order to be able to investigate further. Please post a standalone repro to GitHub I can run locally to repro the issue.